Today I have updated the site and the blog. The whole face has been changed from green to a multicoloured-round-edged site. 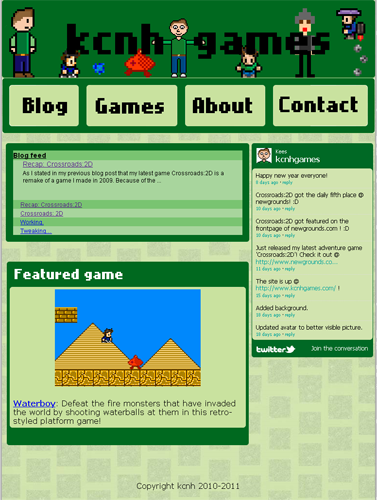 I have added more of my games to the ‘games’ section, and the site has walkthroughs for all the games that are on the site, on the page of the respective games. This meant that I had to make a video for each of the flash games. You can find these on the kcnhgames youtube channel. Use your fire-ball-shooting staff to defeat all waves of enemies in this retro arcade game! Today I released my latest game Mage Arena 2 on Newgrounds! It is a sequel of the arcade game Mage Arena that I made in 2010. I have remade the game because there were a lot of complaints that the controls were not good. So, I fixed the controls by changing the keyboard aim to mouse-aimed shooting. In addition to that I also added new features such as blood, better effects and coloured sprites. As I stated in my previous blog post that my latest game Crossroads:2D is a remake of a game I made in 2009. Because of the fact that the original game wasn’t received as well by the audience as I thought it would, I decided to remake it. However, I did not expect that the game would become such a hit! The game got daily fifth place and was featured on the front page at newgrounds.com. On top of that, the number of people with me in their ‘favourite artists’ list more than doubled from 7 to 15. I have used the Newgrounds API for the ads and to make the four different endings have as reward ng medals. This probably made the game more popular because people like playing games and earning medals/points. Unfortunately, the game was not without bugs when I released it. Despite a lot of beta-testing there were still some (minor) problems. However, thanks to the people that placed reviews, I was able to fix all of them. The sudden increase is due to the fact that the game got on the frontpage of Newgrounds, with a top of 3.77 after which it steadily declined until it stabilised around 3.71. Despite a few hick-ups at the start, I think it is fair to say that Crossroads:2D was a small success. Just released my latest game Crossroads: 2D on Newgrounds! It is a 2D remake of the text-adventure Crossroads that I made in 2009. I have remade the game because most people aren’t very fond of text-based games, which is a shame since it was a decent retro game (if I do say so myself). The 2D version is not copied exactly because I had to change some details. For example, the the ravine in the original has been replaced by a choppable tree stump and a forest. Looks like the blog feed on the frontpage works but it updates after a while instead of instantly. Posted byKees December 24, 2010 December 24, 2010 Posted inWebsiteLeave a comment on Working. The blogfeed seems to update after an hour for some reason. I am have no idea why it does that. The site is up and running, just tweaking a few things here and there. And checking if the frontpage blog feed thing is working. Posted byKees December 24, 2010 December 24, 2010 Posted inWebsiteLeave a comment on Site is up!